Two border collies sprinted up and circled the Toyota 4Runner pulling up onto the dirt and grass drive. Off to the left sits a home with two charming French doors painted in bright red. Laurie Chapman, 36, stepped out from between the parted doors, donning a bright green shirt in honor of St. Patrick’s Day. Her blonde hair was pulled back and a smile radiated from her face as Chapman welcomed visitors to her home. 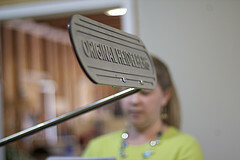 Chapman is the owner of an internet-based stationary business known as Wiregrass Weddings. Her home office is a room riddled with endless amounts of stationary, presentation boards and desks. The two-and-a-half hour drive to Chapman’s home in Elba isn’t a far stretch from a place she used to call home back in college: Auburn University. 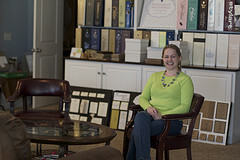 Auburn University is where Laurie Chapman obtained her bachelor’s degree in hotel and restaurant management in 1998. She worked at J&M Bookstore and the Auburn Hotel, and met her husband, Jim Chapman, at Auburn University. Chapman fondly recalls her senior year as her favorite year. She said she enjoyed the friendliness of everyone at the university and, with a little laugh, adds that marrying her husband was another favorite, of course. 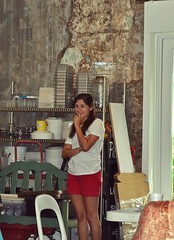 After Chapman graduated, she moved to Elba, Ala., where her husband obtained an engineering job. With few restaurant and hotel management jobs, Chapman decided to get crafty in the most literal sense of the term. She started crafting for some older ladies at her church in 1999. 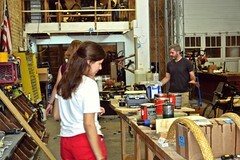 Often she was encouraged to turn her crafting hobby into a business, and this became a reality in 2003. Chapman’s daughter, one of her two children, fell ill, and the Chapman family needed more money to help pay off the medical bills. Deciding to start her own business, Chapman combined her crafty hobby and managerial knowledge to open her online business, Wiregrass Weddings. She speaks fondly of her and her husband’s collaboration on building her work office, and rebuilding a 1950s letterpress. 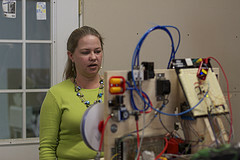 Her husband’s creation of a heated ribbon-cutting machine was helped along by his Auburn engineering degree. Both of their skills have largely contributed to the success of Wiregrass Weddings, Chapman said. Though her products mainly focus on wedding invitations and prints, Chapman’s web site on (http://www.wiregrassweddings.com/) offers a wide range of cute wedding details from banners to buffet markers. The web site screams choruses of praise with great reviews about how timely and perfect the products are. In 2009, the Elba Chamber of Commerce awarded Wiregrass Wedding the most Outstanding Business of the Year for Coffee County. The success doesn’t stop there, in 2010, Wiregrass Weddings placed top 20 out of 4,000 applicants in the Make Mine a Million $ Business Competition held in Houston, Texas, which was sponsored by American Express and Count Me In. Then, in 2012, Inspire Smart Success Magazine chose Wiregrass Weddings’ products for a feature editorial in their inaugural issue. Chapman is not only a business owner. She has also been an active member of the Rotary Club and Chamber of Commerce and was the general manager of a playground-building project in Elba. She also does free printing for organizations such as the Covenant Community Church and Elba’s Girl Scout Troop. 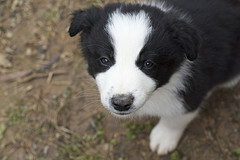 Taking a little break to go visit the litter of Border Collie puppies her dog just had, Chapman quickly picked up a black and white puppy, snuggling it next to her. “This one is my favorite,” she confessed. From running Wiregrass Weddings to helping build a community playground , Chapman’s days in rural Elba are anything but slow. It doesn’t take much time talking with Johnnie Mac and Patricia Edwards to figure out the things that they love: their family, their community, and their God. The couple, both natives of Collinsville, Ala., got married during their time as education majors at Auburn University before returning to raise a family and work in their hometown. 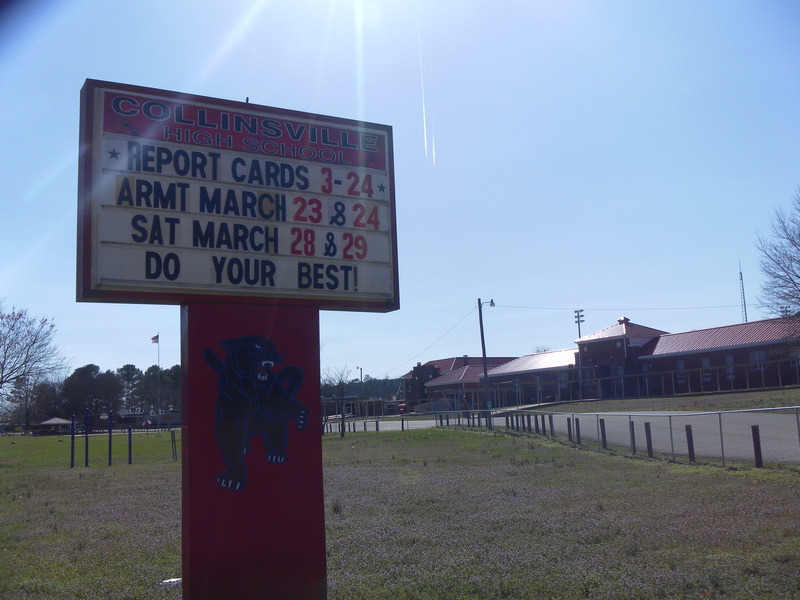 Both retired teachers, Johnnie Mac spent years at Collinsville High School as a high school history teacher and football coach while Patricia worked as an English Language Learners teacher in the elementary school. Something important to both of them is taking up for the needs of the immigrant population, especially the children. Johnnie Mac said that the biggest change he’s seen in his lifetime in Collinsville is the change from a bi-cultural community to a multi-cultural one. Being an ELL teacher, Patricia has had many opportunities to be in close contact with the immigrant population. Johnnie Mac describes how she would pick up van loads of children and take them to Bible school and about a time the mother of one of her students came over to teach her how to make tamales, an authentic and notoriously hard to make Mexican dish. Johnnie Mac also mentioned a former student of Patricia’s, Walter, who still calls her three times a week, even though he was deported back to El Salvador. Patricia has known Walter since elementary school. She was actually the one who made the decision to hold him back in the third grade because his English wasn’t good enough to continue on. The same age as their oldest son, he spent much of his high school years in the Edwards’ home. He was the first Hispanic to join their church, and the first all-state Hispanic football player from the Collinsville High School football team, which was coached by none other than Johnnie Mac. Though retired, both still actively volunteer with church ministries and at the schools. Their son Riley, known as “Coach Riley” to his students, also teaches at the high school. He often teaches the children of the students his own mother taught in elementary school. Walking into the kitchen wearing a Collinsville Panthers sweatshirt, their son spoke about his preparations to soon go to Europe to share his faith through sports-based children’s camps. Sports have also been an important part of Johnnie Mac’s involvement in the community. He attributes the acceptance of the Hispanics into the community to the fact that they were family-oriented and involved in sports, making it much easier for them to find a place in the community. After attending and graduating from Hoover High School, the state of Alabama’s largest school by both population and square footage, Cook decided to mix the idea of her southern high school alma mater with her Northern upbringing by attending Auburn University, an institution she describes as a large school with a “small town feel.” Cook, who started at Auburn in the fall of 2008, characterized her time there as wonderful, adding that “waking up early every Saturday in the fall and wearing orange and blue” is one of her fondest memories. Auburn became a place Cook describes as a “home that I can always return to,” adding that she met life-long friends and received a valuable education. A member of the Tiger Splashers, Golf Gals, a campus liaison for The Layman Group, a member of a social sorority and a writer for the student run newspaper, The Plainsman, Cook was able to find her “niche” quickly at Auburn. “Auburn offered so many opportunities that it wasn’t difficult to find,” she said. Just prior to graduating with a bachelor of the arts in journalism, Cook received a job offer to be a reporter for the Selma Times Journal, which would require her third move south, this time to a city with a history of controversy and a reputation for conflict. But this didn’t daunt Cook, who pegs her time at Auburn as having given her the abilities and tools she needs to succeed in the real world. Jeremy “Boss” Green is using his Auburn roots to grow some new ones at Alma Bryant High School in Bayou La Batre. Sporting a worn navy “AU” ball cap with pride, the 27-year-old Auburn University graduate uses what he has learned through Auburn’s College of Agriculture to help Mobile Bay students learn about the world around them from the ground up. From shotgun safety, fisheries, wildlife science, and turf grass management, Green is educating his students and working to create opportunities to open their eyes to how they can turn a passion for the outdoors into a profession. Green also serves as the Future Farmers of America advisor for his Alma Bryant High School students. Wearing a weathered blue corduroy FFA jacket earned from his time competing in his high school days, Green works to coach teams in tractor safety, floriculture, and livestock judging to compete in the upcoming district and state competitions in Enterprise and Auburn. “Mr. Green, he’s so laid back. He makes it easy to learn,” said Sylvester, an 11th grade student who is currently enrolled in Green’s wildlife science class. When reflecting on his time at Auburn, Green explained how he feels he was not prepared for the real-world experiences he faced once getting out of the “college utopia.” “When you are in college, you are in a whole different world. You make your own schedules and get up and go to class. Out here in the real world, things are a bit different,” said Green. Although Green recognizes the many opportunities that have come his way because of his education at Auburn University, he said he feels that colleges and universities need to begin to do a better job preparing their students for the experiences that arise after college. “Universities share a responsibility in making productive citizens,” said Green. When talking about the community surrounding Alma Bryant High School, Green explained the history behind the facility. Prior to Alma Bryant, students in the area attended one of two schools in Bayou la Batre or Grand Bay before the two schools merged in 1999. 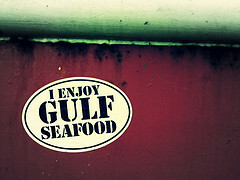 As a coastal community, the citizens of the area have been affected by the gulf oil spill, hurricanes, and a troubled economy. Green said feels that by engaging his students, he can create an air of opportunity and guidance for kids who otherwise might never receive it. Working year round as a teacher, FFA advisor, avid hunter and fisherman, Green keeps busy working to make an impact on his student’s lives. “I have contact with my kids over the summer. That’s when we pick out our hogs!” said Green. As the FFA advisor, Green works with locals to raise hogs to compete with in the annual FFA fair. As a new employee to Alma Bryant, Green quickly made his mark, earning his nickname, “Boss.” It seems his work never ends. “Somewhere along the line, ‘Boss’ came in. Ever since then it’s been ‘Boss Green’,” the Alma Bryant agro science teacher said with a grin. Registered pharmacist Brad Sturgis, 58, took a rather unique road to his job at College City Drugs in Marion, Ala. Born in Atlanta, Ga., Sturgis always had Southern roots, but his father worked as a sales representative for Firestone Tire and Rubber Company and his family moved around a lot. He graduated high school in Akron, Ohio. Nestled in the Black Belt of Alabama, Marion is a far cry from Ohio. So how did Brad Sturgis end up working as a pharmacist in the College City? It was during his college years that Sturgis embarked on the path that would lead him to his future career. As an Alabama resident who wanted a degree in pharmacy, Sturgis only had two in-state options in 1976: Samford University or Auburn University. He chose Auburn University. Sturgis has no regrets about his education path and says he is content with his title as pharmacist at College City Drugs. Sturgis says he is glad he ended up at Auburn University during his college days. His favorite memories of Auburn, he says were “the atmosphere at Auburn and the friendships.” Sturgis returns to Auburn nearly once every year. Even though Marion has seen some tough times in today’s economy, Sturgis says he still likes to go around town. Particularly, he appreciates being able to go out to eat at some of Marion’s local restaurants, spending time on the Marion Military Institute’s campus, and participating in some of Judson College’s events. Doing his part to stimulate Marion’s economy, Sturgis operates College City Drugs five days a week. The drugstore is open Monday through Friday from 8 a.m. to 6 p.m. and on Saturday from 8 a.m. to 3 p.m. College City Drugs is more than just a pharmacy. Carrying a variety of other products, the store doubles as a gift shop. Long-time Hobson City resident Eric Stringer is doing big things for his community. Originally born in Dothan, Ala., Stringer moved with his family to Hobson City when he was just 6 years old. He spent the majority of his childhood in Hobson City, attending Hobson City’s black schools from 1st through 6th grade and transferring to the nearby town of Oxford’s school system when the two schools integrated. “The first two or three years after the schools integrated was really tough, but you know people got used to each other,” Stringer said. Stringer played basketball at Oxford High School before obtaining a basketball scholarship to Auburn. He played for Auburn for four years and through hard work he became one of the early African American athletes to graduate from Auburn. After graduation, Stringer came back to Hobson City but couldn’t find any work. He left his hometown and went to work for Campbell’s Soup for several years before moving to Birmingham to try his hand in the business world. Things didn’t turn out quite as he had hoped in the big city, but one day Stringer’s mother called him on the phone about a job offer back in Hobson City from Stringer’s old advisor at Auburn, Tracy Trussell. Stringer describes this moment as his “call back home.” He didn’t plan on going back to Hobson City, but he quickly decided to come back to his hometown. Trussell, then the dean of instruction at Gadsden State Community College, enlisted Stringer as the director of business and industry training, a position Stringer has kept for the last 19 years. The more time Stringer spent in Hobson City, the more involved he became in his community. His father served as mayor of Hobson City for two terms in the 1970’s so Stringer was always around city business growing up. When Stringer came back to Hobson City, it wasn’t the thriving community he grew up in. Many people had left the smaller town for more opportunities in the surrounding towns like Anniston and Oxford. 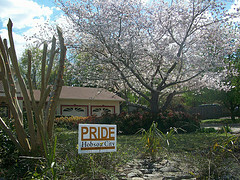 Stringer, along with long-time friend Bernard Snow, formed the Hobson City Community and Economic Development Corporation in 2007 in hopes of building a better future for Hobson City. They work to raise money used for community development projects around the city. “We are trying to change the culture. There’s a brighter view of the world, a brighter view of Hobson City. People just don’t accept change easily,” Stringer said. The HCCEDC has generated $300,000 to $400,000 for Hobson City, he said. Stringer said community apathy is the biggest challenge to their success. “Everything we do is to draw more people into the process and help them to bring about the change.” Stringer added that the park project will inspire the community, showing them how to accomplish the next big project for Hobson City. Tiffany Echols is a southern woman who has lived in rural communities most of her life. Echols grew up in Demopolis, Ala., just a short drive away from Linden, Ala., where she lives now with her husband, Carter Echols, owner of the local grocery store in Linden called Papas Foods. Echols attended Auburn University and graduated with a degree in apparel merchandising. She was the first in her family to earn a college degree. She says she began decorating homes in the community. Slowly but surely she realized there was a need for certain products in the community that people couldn’t get other places. That realization eventually led her to open Persnickety, right next to Papas Foods. One of the biggest struggles in Echol’s life currently is the work her and her husband are doing to adopt a child from Honduras. “It’s a whole other issue dealing with all the paper work and what not.” She says once everything is completed she and her husband plan to adopt more children. In regards to citizenship, Echols says she and her husband are always trying “to help with projects we think will help bring people in, things like Chilly Fest and church activities.” She is also a member of the Quest Club, a local civic group in Linden. Echols says there is a need for more cultural and entertainment outlets for the local citizens to enjoy and would like to work on improvements in that area. Echols says, “My whole goal is to not be like Wal-mart. I try to have a niche and do my own thing.” Echols also believes that if there was more community promotion for businesses then local shopping could increase. Overall, Echols says she tries to be an active member of her community.